BRAND NEW MILLTEK SPORT STAINLESS STEEL. NON-RESONATED CAT BACK EXHAUST SYSTEM. FOR THE VAUXHALL ASTRA'H' (Mk5) VXR 2.0 TURBO. THIS IS OUR MOST POPULAR EXHAUST SYSTEM FOR THE ASTRA VXR! (fitting available, please enquire for details). VX2209R - Non-Resonated Centre Section. VX2213 - Over Axle Link Pipe. Tail pipe diameter - 153 x 77mm Special oval. Pipe diameter - 2.50 (63.50 mm). Mandrel bends for optimum flow. With over 30 years continuous experience, in developing performance exhaust. Milltek have now become a market leader in key marques. Milltek Sport exhausts are produced in high quality type 304 aircraft grade stainless steel. This material is anti-magnetic (other manufacturers stainless steel may not be) and is less susceptible to discolouration. This quality of stainless steel is used on all pipe work and the total construction of the silencer. Mandrel bending ensures full flow bends for better gas flow and Milltek systems are increased in bore to ensure ultimate performance without the loss of mid range torque. Milltek Sport exhausts have a genuine performance edge - noticeable power gains, sounds that are truly awesome, styled looks that are aggressive but discrete and a feeling of true exhilaration. Substantial weight saving over original equipment systems. Highest quality aircraft grade stainless steel. Low pressure systems for maximum performance. More than 30 years of continuous exhaust development and technical expertise are drawn upon to develop the ultimate Milltek Sport range of performance products, offering an ever-expanding comprehensive selection of performance exhausts which build on the successes of key marques. This has placed Milltek Sport at the forefront of tuning companies and owners'must have' list. Milltek Sport have appointed key distributors and are currently exporting to more than 80 countries around the world. 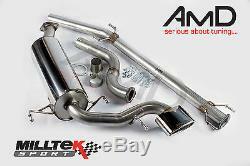 Milltek Sport exhausts are produced in high quality type-304 aircraft grade stainless steel. This material is anti-magnetic (other manufacturers' stainless steel may not be) and is less susceptible to discolouration. This quality of stainless steel is used on all pipework and the total construction of the silencer. Mandrel bending ensures full flow bends for better gas flow and Milltek systems are increased in bore to ensure ultimate performance without the loss of mid-range torque. All Milltek exhausts are designed, developed and manufactured in-house in the UK. Close co-operation with car manufacturers and dealers allows Milltek Sport to develop performance exhaust and Hi-Flow catalyst solutions right at the beginning of the vehicle life. Milltek Sport is run by car fanatics - our reputation has grown out of our continual quest for knowledge, supported by a meticulous attention to detail. Milltek Sport spend many hours testing and demonstrating our project vehicles to both our dealers and the public; our enthusiastic driving style is designed to take our products to the very limit of durability so that you can enjoy your Milltek Sport product for many years to come. Milltek Sport has links with a number of race teams throughout the world (such as the British Touring Car Championship, Time Attack and the VW Cup), supplying them with prototype designs for testing in highly demanding circumstances. Excluding These Postcodes / areas. AB10, AB31-AB39, AB40 - AB42, AB43-AB45, AB51-AB56. FK19-FK21, HS1-HS9, IV1-IV28, IV30-IV32, IV36, IV40-IV49, IV51-IV56, IV36. KA27, KA28, KW1-KW3, KW5-KW17, PA20-PA39, PA40-PA49, PA60-PA78, PH1, PH5-PH9, PH10, PH15-PH26, PH30-PH44, PH49-PH50, ZE1-ZE3. Northern Ireland, Southern Ireland, Highlands, Orkney, Shetland, Guernsey, Jersey, Isle of Wight, Isle of Man. The item "Milltek Astra H VXR Cat Back Exhaust System Non-Resonated Stainless Steel 05-10" is in sale since Wednesday, June 07, 2017. This item is in the category "Vehicle Parts & Accessories\Car Tuning & Styling\Performance Exhaust\Other Performance Exhausts".